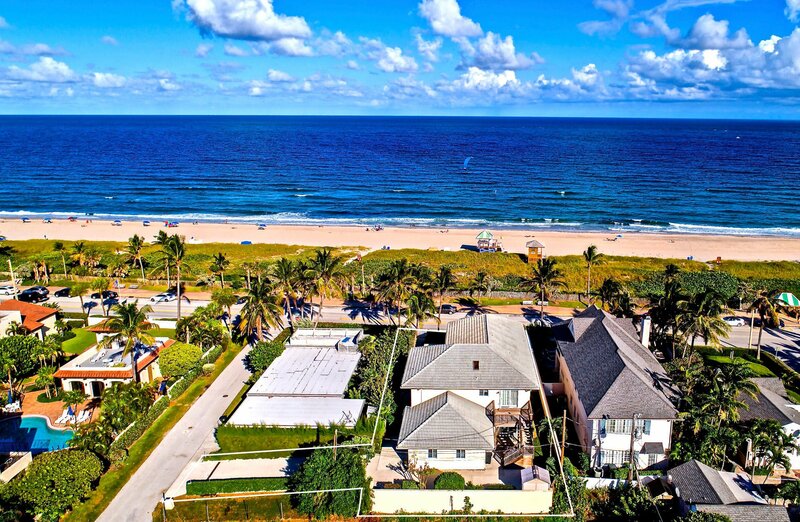 This magnificent home fronts Delray's world-class beach and sits along the famous beach promenade. Set atop a natural ridge on one of the highest elevations on Delray's barrier island. With the home's choice setting on the property, 220 South Ocean offers unobstructed, panoramic views of the Atlantic Ocean to the East, North and South. A west-facing second level balcony allows for sunset views overlooking the town of Delray Beach.South Ocean Boulevard, Delray Beach's premier address. Just steps to the sand and a short two blocks down the ocean promenade to Atlantic Avenue, where the beach and downtown meet! Enjoy beachside festivals, high-end galleries and boutiques, and famed restaurants. Set off South Ocean Boulevard, amidst manicured hedges and Coconut Palms that sway with the ocean breeze, this home ensures Florida living at its finest. Offering a unique two-story floor plan with full kitchens, living and dining rooms, and bedrooms on both levels, 220 South Ocean totals 4,908 square feet with five bedrooms plus a den/office (or sixth bedroom), three full baths and one half bath. Downstairs, the living room is spacious, bright and airy with high ceilings and plentiful windows overlooking the front garden and ocean beyond. Set just off the dining room and kitchen area, two bedrooms share a full bathroom on this level. With French doors overlooking the entry garden, an office or third downstairs bedroom, is served by a half bath. Ascend the staircase and you are greeted with incredible, 180-degree panoramic views of the beach promenade and Atlantic Ocean. The second level living space offers an open kitchen, dining and family room, all overlooking the ocean through walls of glass. Stepping out onto a covered ocean-facing balcony, sunrises and soothing ocean breezes are enjoyed. From both its walls of glass, as well as its sun-balcony, the large master suite with sitting area affords more spectacular views of the beach and the property's gardens. The master suite is completed with a spacious master bathroom and built-out walk-in-closet. Two additional bedrooms are served by a full bathroom on this level, one of which has a west-facing balcony, perfect for enjoying Delray's sunsets. DISCLAIMER: *Tax rolls reflect a lot size of 8,960 square feet. An additional easement of 1,600 square feet that "runs with the land" is included with sale. Ask listing agent for more information. The written and verbal information provided including but not limited to prices, measurements, square footages, lot sizes, calculations and statistics have been obtained and conveyed from third parties such as the applicable Multiple Listing Service, public records as well as other sources. All information including that produced by the Sellers or Listing Company are subject to errors, omissions or changes without notice and should be independently verified by any prospect for the purchase of a Property. The Sellers and Listing Company expressly disclaim any warranty or representation regarding all information. Prospective purchasers' use of this or any written and verbal information is acknowledgement of this disclaimer and that Prospects shall perform their own due diligence. Prospective purchasers shall not rely on any written or verbal information provided when entering into a contract for sale and purchase. Some affiliations may not be applicable to certain geographic areas. If your property is currently listed, please do not consider this a solicitation. In the event a Buyer defaults, no commission will be paid to either Broker on the Deposits retained by the Seller. "No Commissions Paid until Title Passes." Buyer pays title insurance, Florida documentary stamps, and all other closing costs for New Construction and land use. Copyright 2016 Listing Company. All Rights Reserved. *Tax rolls reflect a lot size of 8,960 square feet. An additional easement of 1,600 square feet that "runs with the land" is included with sale. Ask listing agent for more information.